As you’ll probably know, the term ‘fruit machine’ comes from the iconic watermelons, cherries and lemons that graced the reels of the very first slot machines, the so-called ‘one-armed bandits’. 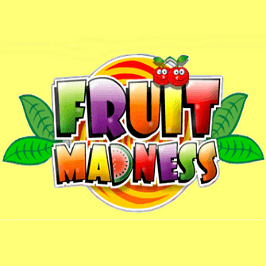 If you’re a fan of those vintage games then Fruit Madness, a five-reel, nine-pay-line slot from Ash Gaming, may well bring a nostalgic tear to your eye. 100% Welcome Bonus up to C$200 + 100 Extra Spins! Despite its relative youth, only launching in late 2015, Kaboo Casino has quickly risen up the ranks of the web's top slots casinos. Offering hundreds of slots wrapped in a captivating yet unique sci-fi theme, Kaboo Casino should be a sought-out destination for all players looking to indulge in some spinning! Although it has an immediately familiar feel with its fruit symbol characters and old-school graphics, it’s clear this Fruit Madness slot isn’t stuck in the past. Unlike the original cherries, lemons et al, the fruity emblems used in this game have faces and, dare we say it, personalities. Some animations have been thrown in as well to help engender a more lively and contemporary vibe. As you’d expect, the gameplay is straightforward. You can play on just one payline or opt for all nine. Seeing as your chosen stake-per-line is multiplied by the number of lines in play, you’ll probably find hitting all nine the most lucrative approach. It’s worth mentioning that all of your wins are subject to a triple multiplier during this round (unless you activate the bonus feature). The last icon to note is the money (paper bills and coins), the game’s bonus. If you manage to get three or more of these on a winning bet line then you’ll trigger the Spotlight Bonus round. This feature sees a pair of spotlights start streaming around before eventually coming to a halt on a specific fruit symbol, each of which affords a different multiplier prize. The bell is the one to look out for here: if five of them get lit up by the spotlights then you’ll walk away with a cool 2,000-times your wager. Note: this feature can also be activated during a free spins round. It’s fair to say there are a lot of fruit-themed slot games competing for attention these days. Because of this, it’s tempting to think they’re all more or less the same. Whilst this may be true to a certain extent, the Fruit Madness slot machine puts an enjoyable twist on the genre and incorporates a number of impressive features into the mix to boot. A refreshing entry in a busy market. If you like Fruit Madness - You'll like these slots too!